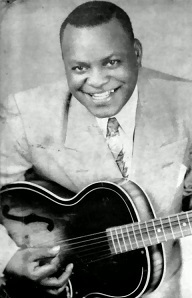 Though only briefly a national presence with a few hits to his credit, Smiley Lewis was a mainstay of New Orleans rock ‘n’ roll throughout the 1950’s and the originator of a handful of classic songs that went on to greater notoriety when done by more established legends. Lewis was born Overton Amos Lemons in 1913 in Union, Louisiana and following his mother’s death while still a youth he found his way to New Orleans where he was taken in by a white woman in the Irish section of town. He became proficient on guitar and was the frontman of a solid band who worked the city following World War Two, anchored by pianist Tuts Washington, a local legend on the keys. Signed to the DeLuxe label in 1947 following their success with fellow New Orleans artists Paul Gayten, Annie Laurie and Roy Brown, the group made their debut on wax in the fall before King Records acquired control of the label and shelved the other record scheduled for release. For two years Lewis had to sit idle watching as one singer after another from The Crescent City got their chance on record, many of them scoring hits while he was forced to do manual labor jobs to make ends meet while singing at clubs hoping for another break. He finally got one when Imperial Records, who’d moved in to corner the market on New Orleans artists following DeLuxe’s abdication, signed Lewis in 1950 at the behest of former neighbor Dave Bartholomew who was now heading up their A&R in the city. Despite Bartholomew’s golden touch and some great material they recorded over the years Lewis remained mostly a local seller, even as more and more New Orleans artists were breaking nationally and in fact dominating the rock scene of the fifties. Lewis by contrast had just four hits during that time, all while seeing other artists such as pop singer Gale Storm cover his biggest seller for the pop market, taking sales away from him. Elvis Presley and Fats Domino both waited until his originals had run their course before cutting some of his best songs, but unlike Smiley they had no problem bringing those songs into the Pop Top Ten. Even the groundbreaking use of one of his songs in Baby Doll, a mainstream movie directed by the legendary Elia Kazan in 1956, just the second example of a rock song being used by Hollywood for a non-music related picture, couldn’t break him open, though years later Aerosmith would gain notice for covering the song and by the 1958 his window of opportunity for mainstream stardom had shut. Some of the problem may have been that his echo-laden metallic voice was too harsh sounding for an increasingly middle-American audience that began to control more of the rock market in the mid-50’s, or that his songs reflected a more adult perspective that was difficult for teen listeners to relate to, though the success of his material for others probably refutes that argument. Whatever the reason though his failure to succeed at the same level as his competitors, despite using the same top-notch studio band with the same producer on the same label earned him the nickname “Hard Luck Smiley”. By the start of the 1960’s the changing market led Imperial to cut him loose and soon after Lewis was diagnosed with cancer. Always a popular performer around New Orleans a benefit was held to raise money for his treatment but Lewis – just 53 years old – passed away before it took place, epitomizing his hard luck to the end.